Anybody planning on going to Rogallo at Jockey’s Ridge? I’m really, really, really hoping to make it. Absolutely.. this is an event I try to make each year..
Great! I’ll be down for Saturday only, with lots of driving. Come shake my tent if I’m asleep. Hopefully wind will cooperate. 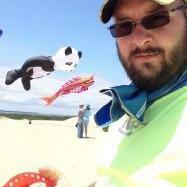 if so come fly a few of the Diamonds kites!!! I have a room!!! Staying at Traveler’s Inn in Elizabeth City on Friday night so I can get to Jockey’s Ridge earlier. I’ll still have to buzz out Saturday afternoon to get home as early as I can. Winds are looking extremely light for tomorrow. Let's hop it improves a bit..